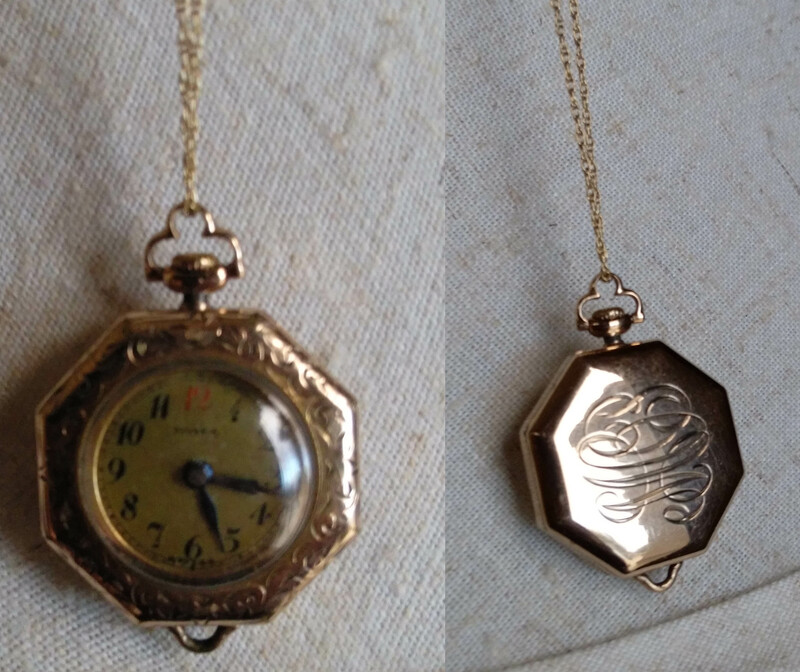 Front and back of Myrtle’s watch. Even in 1913 this was an auspicious birthday. On 18 January of that year Myrtle Primm received a gold watch. Octagonal in shape with a round face, the watch has delicate carvings, and her initials are engraved on the back in fine script. When I was sixteen, the watch passed to me. Although the watch no longer keeps time and the band is broken, I still wear it, hanging from a chain, on special occasions. It’s one of my few heirlooms (this week’s prompt). I was a little girl when Myrtle, my paternal grandmother, died. I barely remember her, but those who do have very fond memories: Myrtle stood about five feet tall and her feet were so small she couldn’t buy shoes at the store. She had to wait for the salesman to come to town and purchase sample shoes. Everyone who knew her said she was the sweetest person they had ever met. As a little girl she loved to chase butterflies and had a little net to catch them in. Before she married, she lived with her parents on Montgomery Street in Charlotte, spending her time learning music (she played violin) and singing alto in the church choir. Not all her time was spent on music, though, as word has it she was a pretty good shot with a pistol. 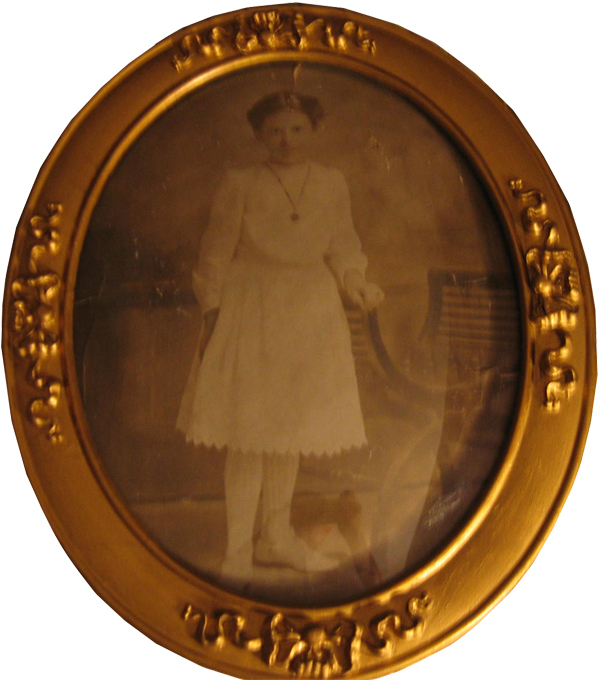 Myrtle was born 18 January 1897 in Charlotte, North Carolina, to James Alexander Primm (1856-1934) and Martha Ann Virginia Deaton (1860-1932), the seventh of nine known children (the 1910 census states there were 12 children in all), and the youngest of three daughters. Two of her brothers died as infants, one before she was born. 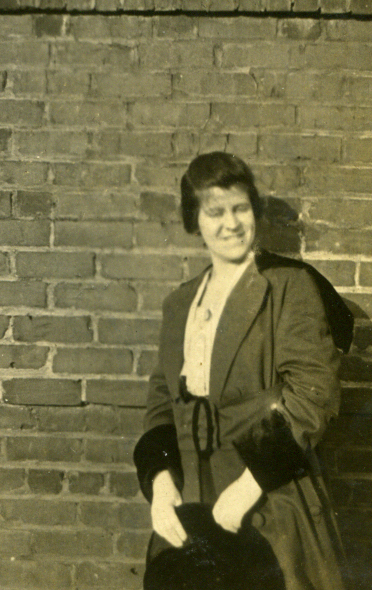 Myrtle Primm as a young woman in Charlotte. The family lived in a section of Charlotte called Seversville, named after the man who developed the land, Henry Clontz Severs, who was married to Myrtle’s paternal aunt, Mary Roxanna Primm. Myrtle’s father, James, worked at the iron works foundry as a watchman, but by 1920 he had taken up farming, although the family still lived in town. There were lots of young people in the Seversville area, and Myrtle met and married Andrew Hamilton Rohleder, Jr. (1900-1974) on 21 January 1920. Robert B. Owens, a priest of the Protestant Episcopal Church, performed the marriage ceremony for the couple on 21 January 1920 at his residence in Charlotte. Myrtle’s family was Presbyterian and Andrew’s family was Episcopalian; they compromised and joined the Methodist church. Myrtle was active in her church and was elected vice president of the ladies aid society. Children soon followed. On 9 November 1920, Andrew and Myrtle’s first son was born and named after his father, Andrew “Andy” Hamilton Rohleder, III. Son number two, Milton “Bub” Arnold, was born on 23 July 1922, and son number three, Jack Carlton (my father), was born on 17 September 1927. The family lived with Myrtle’s parents in her childhood home on Montgomery Avenue. When the depression started, Myrtle’s parents moved out to the family farm and the Rohleders stayed in the house. Eventually, though, the Primms sold the house and Myrtle and her family rented a house from her aunt out near the family farm. Andrew worked for M & F Bonded Warehouse Company as a supervisor until the depression. The company folded and his job along with it. However, he was able to get employment with an insurance company as a salesman. In 1935 another warehouse supervising job opened up in Rockingham, North Carolina, and upon accepting the position, Andrew moved his family to the small town east of Charlotte. 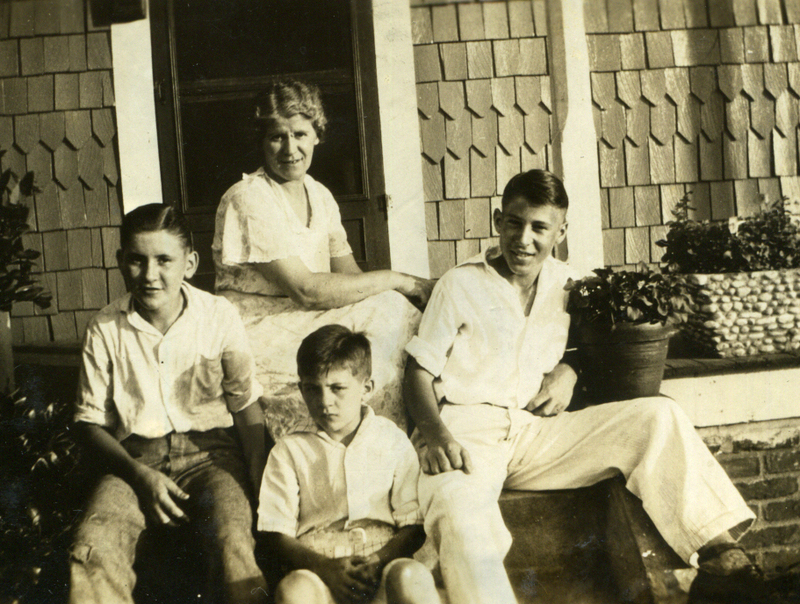 Myrtle and her three eldest sons, (l-r) Bub, Jack, and Andy, in Rockingham. The Rohleder family settled into their new home on Leak Street in Rockingham. The three boys matriculated into the local school system, and Myrtle was active in the Methodist Church. She was a greeter on Sunday morning, a devotional leader for the ladies Bible class, the class mother for the men’s Bible class, and wrote lovely prayers. After some time in Rockingham, Myrtle discovered she was again pregnant. After three boys she really wanted a little girl. But, alas, it was not to be—she had another son, Bill (still living). Bill remembers that he was terribly afraid of thunder and lightening as a small child. His mother took him out on the front porch, held him in her lap in the rocking chair, sang to him, and told him there was nothing to fear. He believed her and to this day goes outside to sit and watch storms. Bill recalls his mother had a calming effect; she never raised her voice and made one feel as if everything would be alright. 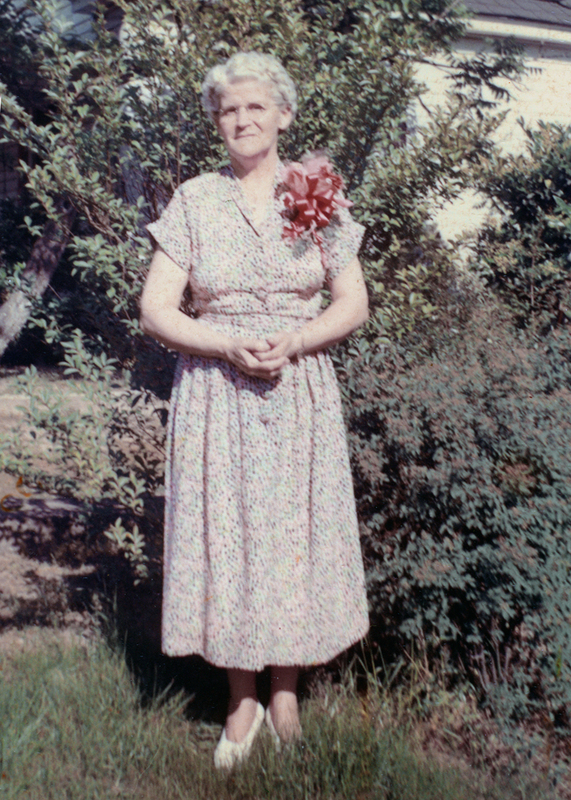 Myrtle about 1943 in Rockingham. If you look closely, you can see the watch on her left arm. When World War II started, her two eldest sons joined in the fight—Andy as a Navy pilot in the South Pacific, and Bub in the Army stationed in Hawaii. Maybe it was to make up for missing her own boys, but she invited all the friends of the family who had joined in the war effort over to the house when they were home on leave. She would have cake and coffee and take dozens of pictures. In October 1944 Myrtle got the correspondence no mother ever wants to get. Her son, Andy, was missing in action over Formosa (now Taiwan). His remains were found in May 1946, and eventually buried at the National Cemetery in Honolulu, Hawaii. Even as the remaining elder boys started leaving home, Myrtle still had a young son to raise and church activities to keep her busy. 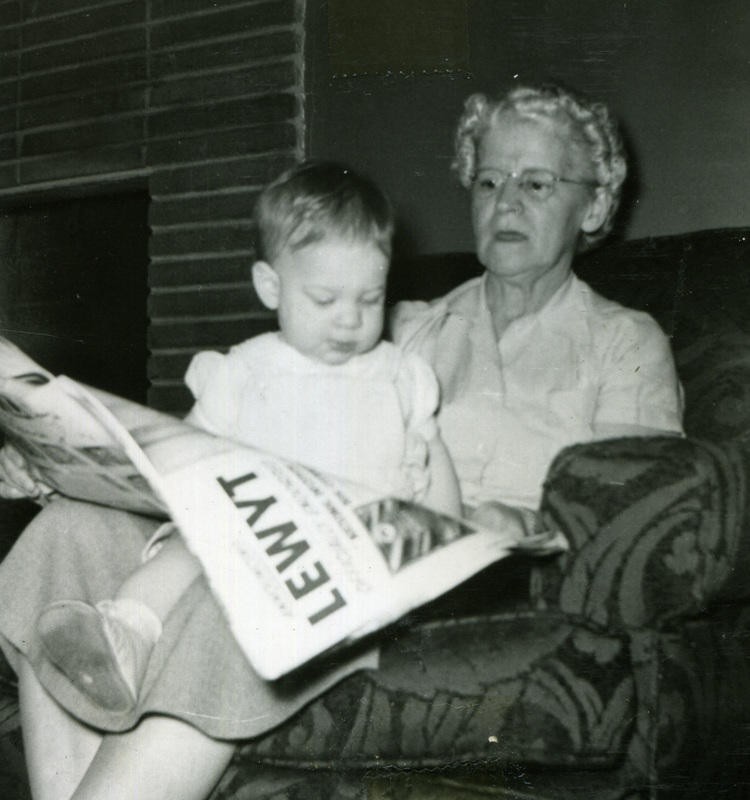 Here I am reading the newspaper with my grandmother. Bub and Jack married and started having children. Bub lived nearby, which provided Myrtle ample access to grandbabies. Jack lived in Charlotte, which involved a road trip to visit the grandbabies. I remember once when Daddy had to work a week in Rockingham and took me along. We slept at my mother’s parents’ house because they had a bit more room, but I spent the days with Myrtle. MaMa, as I called her, had snow-white hair that was always perfectly done. Myrtle had her first heart attack in 1955 and spent a week in the hospital. On 25 August 1959 she entered the hospital again with similar symptoms. She died at the age of 62 on Saturday, 5 September 1959, of a coronary thrombosis. The funeral was held the next afternoon at First Methodist Church, filled to capacity. She’s buried in Eastside Cemetery in Rockingham. Myrtle’s lengthy obituary, written by family friend and journalist Isaac London, describes the funeral and her life, and appeared on the front page of the local paper. I wish I had the chance to know her better, and every time I wear her watch I think about her. This entry was posted in 52Ancestors, Deaton, Primm, Rohleder. Bookmark the permalink.